If hell does exist, I reckon it bears more than a passing resemblance to one of the many overcrowded London bus routes in the heat of summer. Over-tired children, sweaty passengers and dubious aromas combine effortlessly with roadworks and traffic jams to create the ultimate dystopian existence. If you’re unfortunate enough to reside in this microcosm of despair on a daily basis, you might want to consider one of these Daniel Vaudd’s scented Hand Fans*. 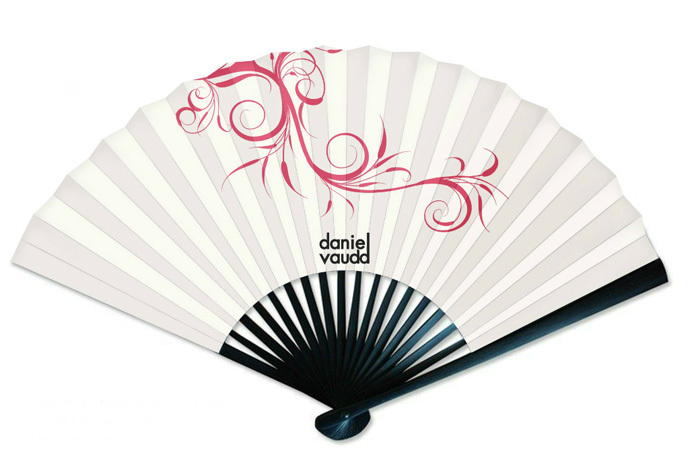 The fan is delicately scented with Radiantly Romantic, Daniel Vaudd’s beautiful inaugral EDP. Floral without being flowery, light and summery without a hint of sharpness. It’s ethereal, wisp-like… and combined with the sweeping motion from the fan, creates a breath of fresh air that transports you to a rose-scented garden with every swoosh. The fan comes complete with a fragrance vial to top-up the heavy paper when the scent begins to fade. It’s become a permanent addition to my handbag over the last week, an instant mood-lifter and not a drop of caffeine in sight! Thanks just forwarded that to my sister as a lady of a certain age is prone to the occasional ‘flush’ or ‘the vapours’ as we ;like to call it and she keeps a japanese style fan in her bag but this is a much nicer alternative. I think hand fans need a serious comeback. We all need to relearn how to be ladeez. I want one bad. Your review has made me so excited to try it!!! I was a little put off by the price, but on reciept of it I can tell it’s a really quality product, and TOP TIP if you open it out in a room it is an amazing air freshener! !